The Zebra Wristbands are extremely durable and highly resistant to wear and repeated exposures to soapy water, foam washes, blood, alcohol and iodine. The wrist bands can be printed with a linear and 2-D bar codes that are high-resolution and high contrast print that can be scanned immediately. Because patient information stays readable, hospitals can leave the medical identification bands on through a patient's stay, avoiding the nuisance of frequent replacement while saving the hospital money. 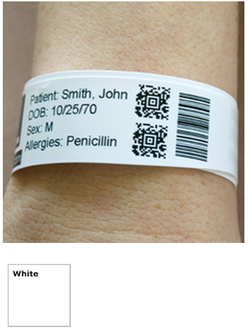 This high-resolution print, on a durable latex-free material, produces a precise printed bar code that delivers an immediate first-time scan while remaining smudge-proof and accurate throughout the patient's stay.